Colossus Level 1 training focuses on the 13 key fundamental strengths that are missing in nearly every doctor’s treatment notes. This training course covers the important topics of mechanisms of injury, concussion recognition, pre-exam interviews, pre-existing conditions, gaps in care, ADL’s and quality of life survey’s, prognosis development, valid treatment plans, re-exams/surveillance exams, Maximum Medical Improvement, impairments, future medical costs, summary reports, amending medical records and more. This course will help you understand what insurance medical management software is looking for in treatment records, findings and terminology that can be used to discount and deny valid care. Colossus Level 1 training will help you avoid weak terminology and unsupported documentation steps that damage medical value. 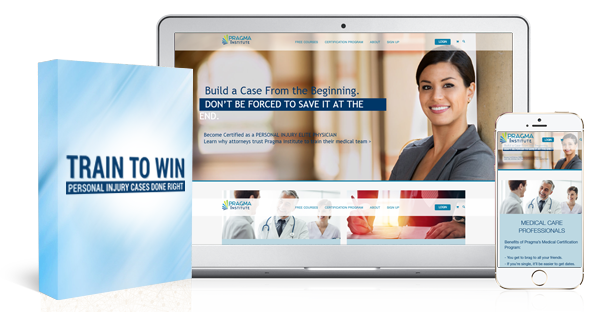 You will learn to create solid evidence of medical necessity, empowering the doctor and the attorney to push for better reimbursements and settlement value. Graduates are better able to secure a wider range of treatment options, defensible increases in duration of treatment and receive better reimbursements for validated care than most insurers want to allow, successfully helping the injured to more fully recover from their losses without the threat of financial disadvantage, losses that happen when you do not keep up with evolving personal injury benefits. ** For even more value, please consider the Pragma Intel Subscription Service. This 12 month commitment will include the COLOSSUS Level 1 along with numerous other training materials and form templates that you can leverage within your own practice. Click Here for more information. Mechanisms of injury explain how a person was injured. “rear ended” is not a mechanism of injury, that’s a mechanism of damage. Without a mechanism of injury the diagnoses offered will be assigned a lower medical severity in the medical management software. Being a better injury communicator will help the insurers assign proper medical value to your patient’s injuries and help you get better reimbursement for your services. Concussions occur in approximately 85% of all car crash claims, yet they are actually diagnosed in less than 5% of medical documentation, making them the 2nd most missed injury diagnosis in car crashes. Concussions have a significant effect on the outcome of all injuries and injury recovery care. If not treated promptly and correctly the damage can alter brain function for a lifetime. Awareness of commonly overlooked symptoms as taught in this training module will improve your recognition and diagnosis of this critical injury. No matter which way you slice it, Rushing To Therapy is a bad idea and it has a devastating effect on medical care. The rush results in missing subtle injury symptoms that convey injury severity, minimized and missing diagnoses, misapplied therapy, missed/mis-coded injury symptoms and poor treatment plans. Clinician miscommunication leads insurers to believe that the sustained injuries are minimal, since minimal effort was used in documenting and diagnosing the injuries. This style of treatment leads to insurers to flag these types of doctors as unskilled and likely to accept discounted reimbursements or denied care. Pre-existing conditions are grossly misunderstood and, contrary to belief, these conditions do not diminish the necessity and value of your care. Pre-existing conditions are not the fault of victims. They didn’t ask to be injured in a car crash and they need care. Despite stories you may have heard about insurers denying coverage for services provided to patients with pre-existing conditions, that denial was more likely due to the treating doctor not knowing how to correctly discover, validate, document and communicate those pre-existing conditions for proper validation and better reimbursement. What is a GAP in care? It’s when your patient has had a break in care the exceeds an allowable period of time. GAP’s can dramatically suppress medical value, regardless of injury severity and the care provided. GAP’s in treatment result in severely discounted medical value reimbursements! There are also certain variable times allowed for GAP’s in care. Knowing what’s allowable, knowing which steps can be taken to overcome disallowable GAP’s and what can be done to minimize their damaging effects on medical value are taught n this module. Do you know exactly how, why and what they do to help … or hurt? Surveys are misunderstood on how best to use them in personal injury care. If you don’t how they help, why are you doing them? Did you know that they may not really have the impact you think they do. It’s reported that 97% of injury claims never make it to trial, so what is the right, clinically appropriate survey tool to use? Catchall surveys are more of a scouting tool to use for identifying overall status. Specific surveys should be used to document selected injuries separately from other injuries. There are 3 global surveys you should be using on every injury case. Impairment ratings are one of the most important services you can offer for your patient after they have reached Maximum Medical Improvement. If there are any permanent injuries when you release the patient from active therapy, an impairment rating must be provided. As little as a 3% impairment can have an impact on the medical value of an injury in medical management software. Impairments are easily missed in 97%+ of all car crash injuries. Most doctors do not know what edition of the AMA guides To The Evaluation of Permanent Impairment are being used in their state. Guides usage varies by state and sometimes within states as well. What is a Plan of Care and how does it differ from a Treatment Plan? Doctors usually confuse Treatment Plans with Plans Of Care. Most doctors are actually using a Plan Of Care, thinking it’s a Treatment Plan. While similar, there are distinct differences between the 2 – both in definition and in purpose. Historically Treatment Plan’s have been followed more as a “required component of care” rather than a deliberate patient-monitored recovery tool. Transforming a Plan of Care into a Super- Plan of Care does not make it a Treatment Plan. Using a Plan of Care to convey injury severity to an insurer is a poor choice resulting in diminished medical value. Re-exams must be performed at a specific frequency, and that frequency is not determined by a traditional healthcare definition or rumor! Timing of the re-exam is as important as performing the re-exam in the first place. The timing needs to be precise and requires key language to be applied to validate continuing symptomatology so that the management software is directed to provide the proper medical valuation. Surveillance exams are used when long periods of time pass before the claim is settled and they protect the medical value, often uncovering latent injuries which can enhance or destroy medical value. Prognoses estimate the severity of injuries and convey duration of recovery, helping adjusters estimate the medical reserve amount. Prognoses should follow medical certainty. The less certain the doctor is about a diagnosis, the more testing and monitoring of progress is required. Training clears this up. What prognoses should you use? There are quite a few. There are 6 specific prognoses that you need to know, used at various stages in medical care reporting and these are provided in the training. Also, prognoses should change as diagnostic certainty and the successful response to therapy is documented. However, when you don’t choose the correct prognosis or forget to change it appropriately over the course of care, you are telling the adjuster that you are not paying attention to your treatment plan. This can lead the management software to diminish the injury severity and decrease the medical value of your care. Practically every doctor uses the term Maximum Medical Improvement (MMI) incorrectly and insurers look for that misuse in the doctors treatment notes. Incorrect use results in severely diminished medical value. At the completion of active therapy, if there are ANY persistent symptoms, those injuries must be addressed in a very precise way that will not close the medical valuation management software prematurely. This is the most correctable of all medical errors, but it requires an understanding of the right medical terminology and its absolutely critical usage. Disinformation on this topic has caused the majority of doctors to refuse to include this critical piece of information. Providing a future medical cost will not get you into legal trouble! Disclosing future medical cost estimations are essential for attorney: insurer negotiations. A patient’s financial reimbursement for medical expenses cannot be justly settled without a knowledge of what future impact the patient’s injuries will have on society. Doctors need to select the right language, provide pertinent support studies and be prepared to confidently calculate ongoing and future medical expenses. Summaries/narrative summaries must answer questions harbored by insurers: Who are you? Why did the person need you? Why did you treat this person to begin with and why should I authorize the medical value of your services? Summary reports validate your expertise, diagnosis, therapy, prognosis, impairments and future medicals. They highlight the injury efforts of a team of doctors, radiologists and therapists who have worked on the case. It wraps up the patient’s injury experience and why their care was medically necessary, all in a concise and powerful statement. Correcting of medical documentation errors is crucial, but how should it done? Amending Medical Records can be accomplished in a legal, ethical and easier to use manner than you realize. The adage “if it isn’t written down, it didn’t happen”, can also be stated as “if it’s written down, it did happen”. How can you correct mistakes without compounding the problem? What if the change is done incorrectly? Are there legal implications or liabilities? There are clear guidelines on this process and that is covered in the Amending Medical Records training module. This module is a limited offer. Please see your promotion offer for more details.